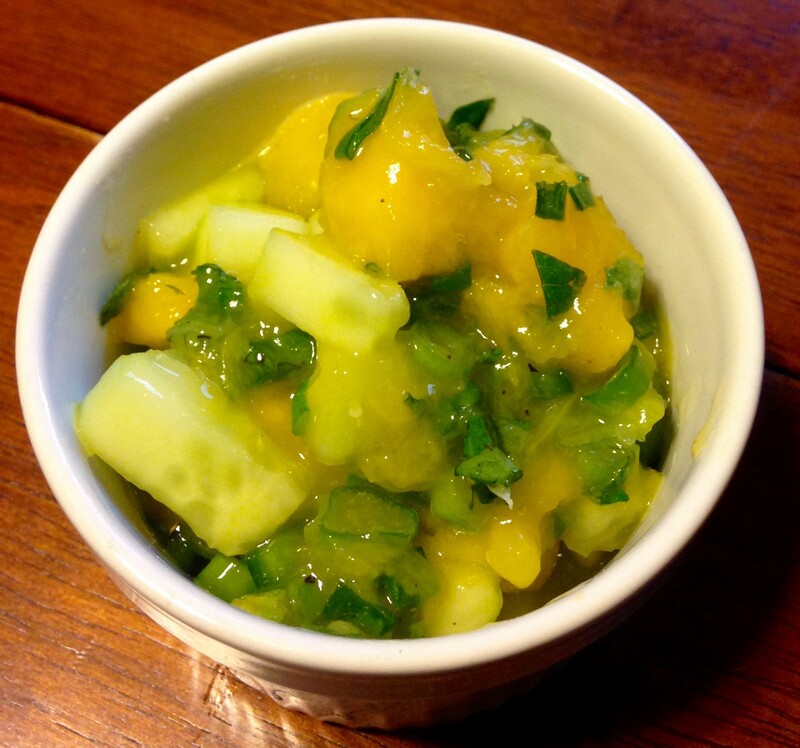 Homemade salsa is one of those things that may seem intimidating but is really quite simple. I made this salsa to accompany a Spicy Shrimp Pretzel Roll sandwich but you can use it for almost anything. The base principles behind it can be adapted in countless ways and is a great example of one of my core philosophies of home cooking. Mango is in season right now so it’s cheap and extra delicious. The sweetness adds a nice contrast to spice and heat. Start by breaking down your ripe mango. Here’s a great video tutorial if you don’t get a lot of practice. They can be kind of tricky, especially if you don’t get your first cut right. 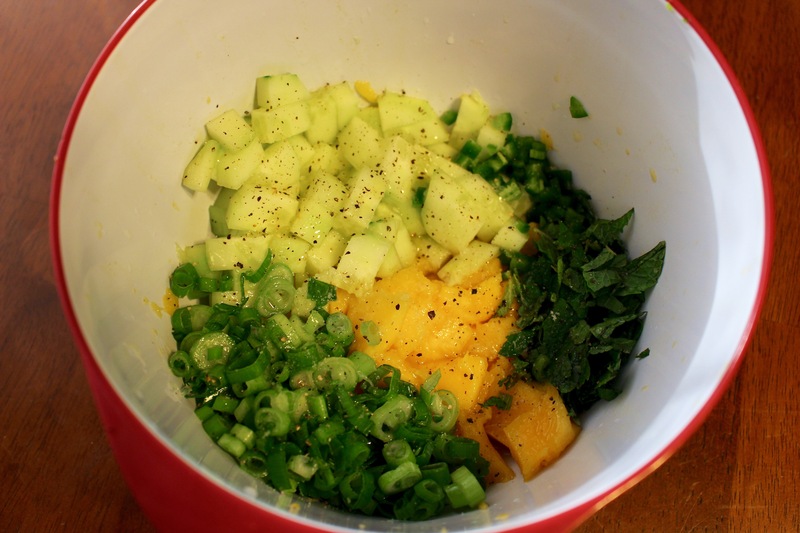 Chop up your cucumber into similar sized chunks as your mango. Ribbon the green onions, about half of the bunch. Do the same with the mint leaves. Use as much jalapeno as you desire. The fresh ones can vary in heat and everyone has a different tolerance. The more seeds you put in the more spice there will be. Combine everything in a large bowl. 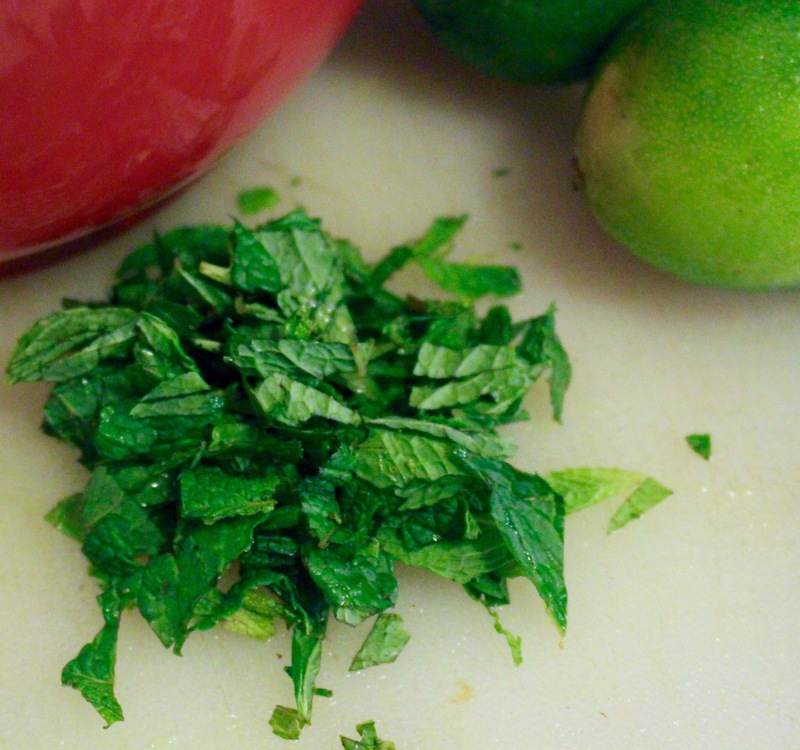 Squeeze the juice of both limes over the mix and add a dash of oil. Two big pinches of sea salt and a few cranks on a pepper mill. Stir it up. If you want to get fancy you can toss it in a blender and pulse it a few times. Before you serve, have a taste or two. You’re trying to balance the water content of the cucumber with lime and salt, so if it’s a little bland or watery add a little of each until you can taste mango, acid and salt equally.